Microcomputer control, DC brushless motor. LCD display, Speed/RCF and time display. RCF is automatically calculated, touching panel. Electronic door locks. Lid safety device. Over speed and imbalance protection. Open the cover automatically when it ends. 10 kinds of program stored in the memory. 2. Microprocessor control, operated by touch panel, LCD from Germany display, operating data can be saved automatically, RCF value can be set directly for working, easy to use. 3. Brushless DC motor, free maintenance, no carbon dust pollution, quick in speed up and down. 4. Automatically electric lid lock, super speed, over temperature protection and imbalance protection. The centrifuge body is made of high quality steel, safe and reliable. 5. 10 kinds of program stored in the memory, 10 kinds of accelerating and decelerating speed for your choice. 6. LCD display. LCD screen is shown RPM/RCF, time and with Minimum 10 memories of program. 7. LCD display, touch panel, automatic calculation of RCF values. 8. Operated by programming, convenient in operation. 9. ABS using, once completed. 10. Widely used in hospital, research institutes, laboratories and other biochemical serum, plasma, and pharmaceutical products for the qualitative analysis. 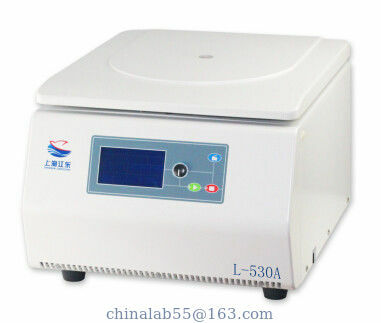 If you have any question or special requirement about the centrifuge equipments, please don’t hesitate to contact us. We shall be glad to hear from you at any time. Thanks for all your kind attention and support!